I have learned from experience that food items purchased via fundraisers are simply not good. It seems like just yesterday that we have 6 dozen gross Otis Spunkmeyer cookies courtesy of a fund-raiser. 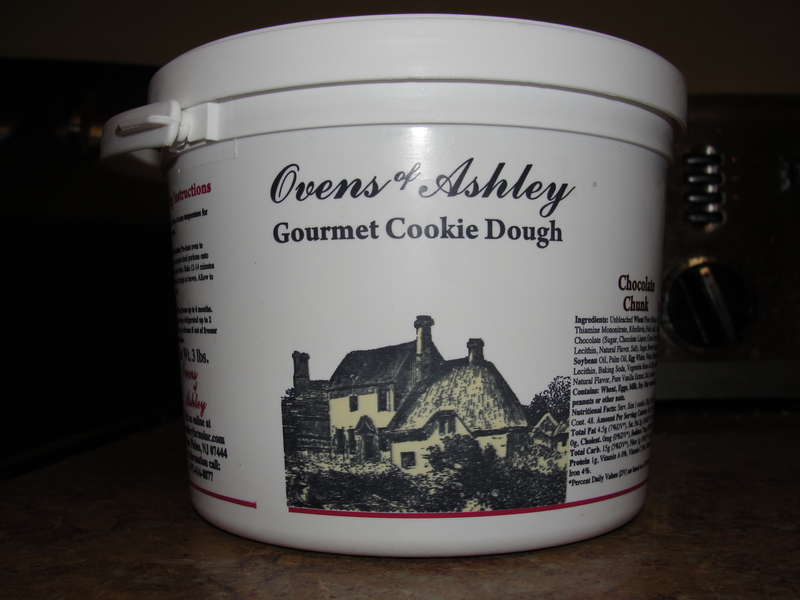 With those horrid memories in mind, I was a bit worried when Mommy brought home a tub of Ovens of Ashley Gourmet Cookie Dough. Ohh no was my first reaction. Why, oh why would we spend more money on more grossly-overly-sugary cookies? So, I proceeded to let the tub of Chocolate Chip Cookie Dough sit in the fridge for almost 3 weeks before I first baked some. I decided that I should at least give them a try. For reason of this blog of course. Let’s just say that they smash the Otis cookies into the ground. While not the sweetest Chocolate Chip Cookies I have ever had, their Subtle Flavor drew me in. I preheated the oven to 300, as the tub said, and spooned out dough for 12 cookies. After baking in the oven for just about 15 minutes, the outside of the cookie was browned and the chips looked nice and gooey. I removed the cookies from the oven, let them cool for about 2 minutes, then moved them to a plate to finish cooling. When I make homemade cookies, I always use a cooling tray but, for whatever reason, if the cookies aren’t homemade, they just get a plate. While the cookies were baking, I could smell the familiar scents of chocolate chip cookies. That warm feeling was running all over my body as I inhaled the smell. While I waited for the cookies to cool down a bit, I let myself take a scent-bath above the cookies. 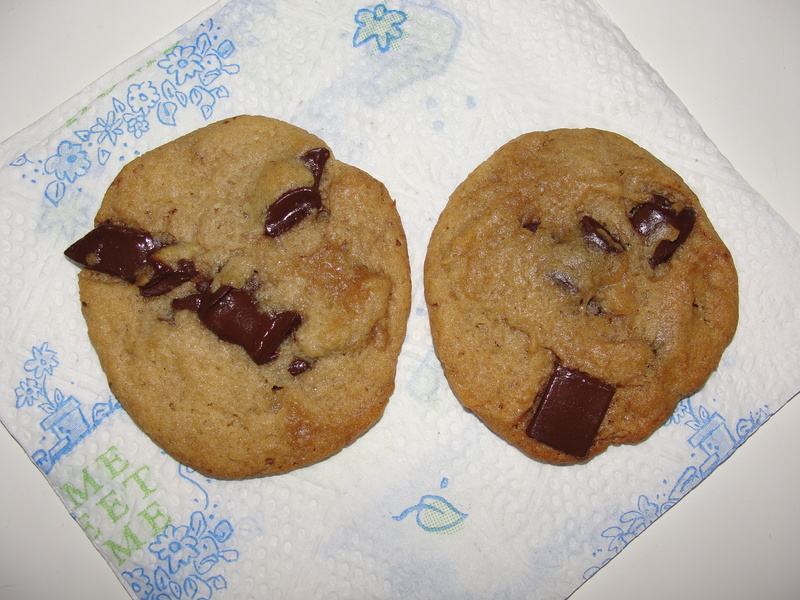 When I decided that I had waited enough, I placed two cookies on a napkin and went to go eat them. As I bit into the cookie, I first felt the more-baked outside of the cookie followed by the less-baked, soft inside of the cookie. I made sure to get some chocolate chip in this first bite as well. Wow. While I certainly did not feel as if I bit into a cube of sugar, I also did not feel as if I had bit into nothing. Perplexed by these flavors, I decided to continue on with the cookie. As I ate my first cookie, I found the cookie dough itself to be perfectly cooked. The outside of the cookie was a bit more baked but in no way burnt or too crispy. 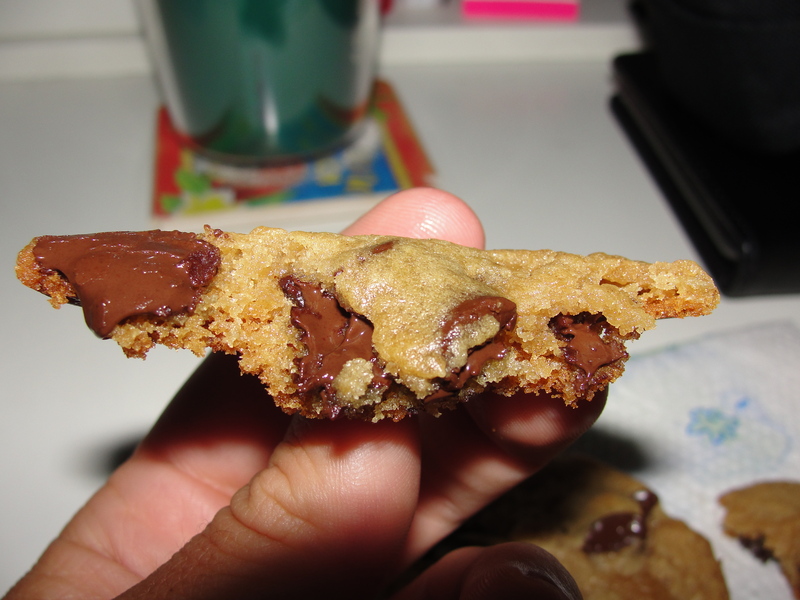 This texture complemented the gooey interiors of the cookie. The cookie was cooked enough as to where the interior was not failing apart – a key aspect in my book. The dough itself was flavored quite basically – I cannot stress enough how non-sugary this cookie dough was. 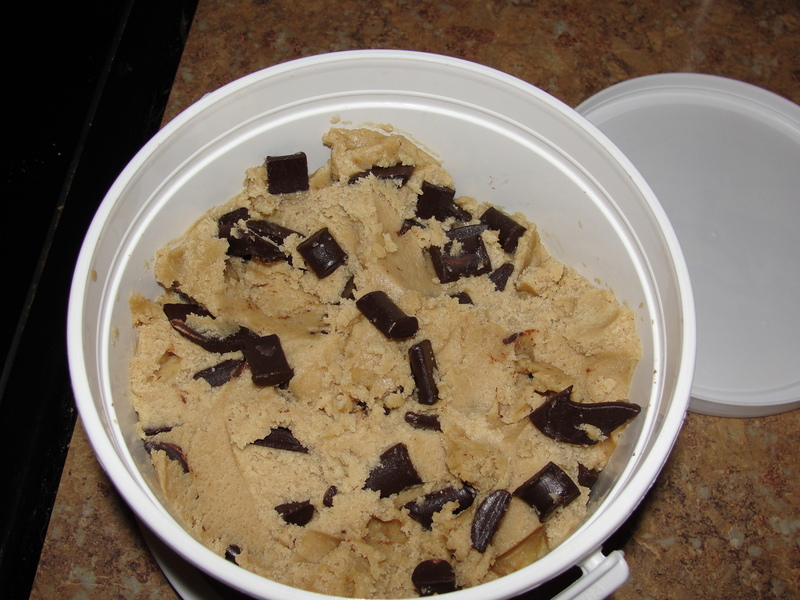 Ovens of Ashley really nailed the amount of sugar & spices to use in this cookie dough. Also, the chocolate chips were very basic in flavor. I would rate these chips are just over the line of milk-dark chocolate. While the chips were not as bitter as dark chocolate, they also were not as sweet as milk chocolate. Plus, the chips were actual chips of chocolate. I normally do not care for chocolate like this, but, it really worked in these cookies. I ate my two cookies and was easily ready to down more. Luckily, I was able to restrain myself. I did follow-up with some cold out-of-the-fridge cookies the next day but, found I preferred them warmed up in the microwave for 20 seconds or so. The cold cookies just lost too much flavor causing the cookie to cross the line from Subtle to Nonexistence – a line I would rather not cross when it comes to food. But, pop those suckers in the microwave for a few, and you have yourself one tasty cookie. Lucky for me, this fundraiser ended up being a good one. I have continued to make 12 cookies once or twice a week and still have some dough to go. Every cookie has been just as good as the next. And, that means that my palate has been invited to the Subtle Flavor of Ovens of Ashley over and over again.